Two Greek police officers were lightly injured on Thursday night after attacks by anarchist groups in the Exarchia area in central Athens. 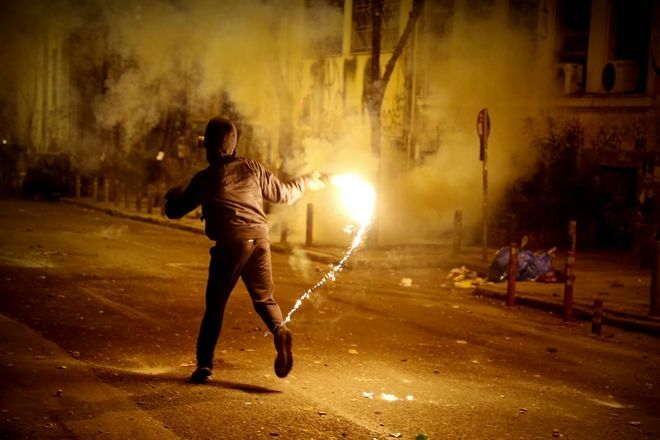 According to the Hellenic Police, a little before 10:00 pm a group of about 30 people wearing hoods came out of the National Technical University of Athens building and started throwing molotov cocktails at a nearby riot police unit. At 10:30 pm another group of people with covered faces hurled fire bombs at another riot squad at Harilaou Trikoupi street in Exarchia. In the two attacks, two police officers were lightly injured. The violent incidents spread on other streets of the area, forcing authorities to shut down Patission avenue for at least one hour. Skirmishes continued throughout the night, with anarchists burning cars and trash containers. The violent attacks followed a banned protest rally that the police union had organized to be held at Exarchia Square. Anarchists had called a counter-demonstration at Kolonaki Square. In fear of violence, the Hellenic Police highest authority banned all Thursday demonstrations in Athens.